Root Canal Therapy (RCT), or endodontics, is the process of removing the nerve and blood vessels from the root(s) of a tooth. 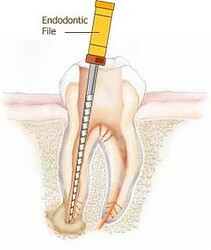 A root canal is often necessary to save an infected(abscessed) tooth. Initially the abscess usually causes pain and swelling. After some time the abscess may 'drain' through a fistula(bump on your gum) and not hurt any more. An abscess typically shows up on an x-ray as a dark spot at the end of the root. This is actually bone loss in the jaw. It is very important to catch this problem before it deteriorates too far. We treat most premolars and front teeth but refer molars to an endodontist (root canal specialist). You will be numbed with a local anesthetic. If possible a rubber dam(small rubber sheet) will be placed around your tooth to isolate it. Then an access hole is made into the tooth to reach the hollow chamber(pulp) in the center of the tooth. Small metal files and irrigants are then used to clean out and sterilize the canals. Finally a 'rubber' material is placed in the root and a 'core' filling material is placed in the access hole. Finally a crown should be placed over the tooth to prevent fracture. 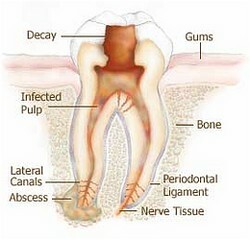 There are a number of reasons why one of your teeth may need a root canal. These include but are not limited to: deep decay that extends close to or into the nerve, a trauma to the tooth that severs the nerve, or a crack in the tooth that extends to the nerve of the tooth. -Moderate to severe lingering toothache pain when drinking hot or cold liquids or foods.